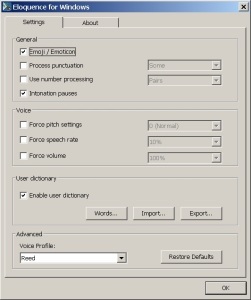 Windows version of the popular Eloquence Text-To-Speech synthesizer. 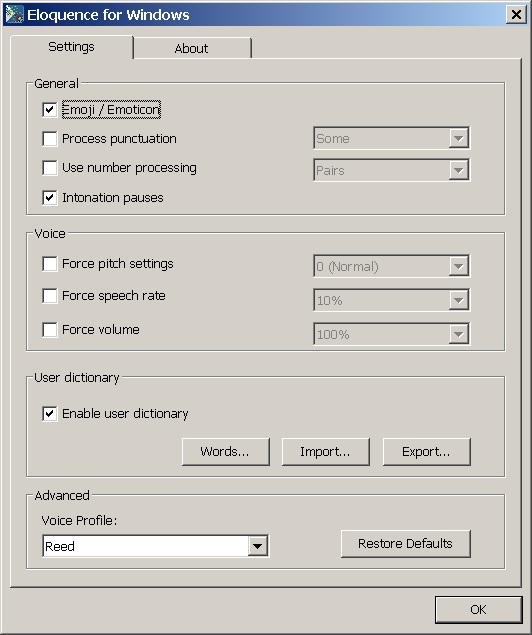 ETI Eloquence for Windows is a SAPI 5 version of the popular Eloquence Text-To-Speech synthesizer. Code Factory believes in developing simple yet powerful solutions that help users enjoy the computing experience and be productive in their personal as well as professional lives. Screen readers like NVDA, JAWS, Window Eyes, etc. Application for blind people that need to produce text to audio. E-book / DAISY readers like AMIS. 10 languages included with a single purchase: US English, UK English, German, Finnish, Canadian French, French, Italian, Brazilian Portuguese, Castilian Spanish and Mexican Spanish. Speech rate and pitch configuration. 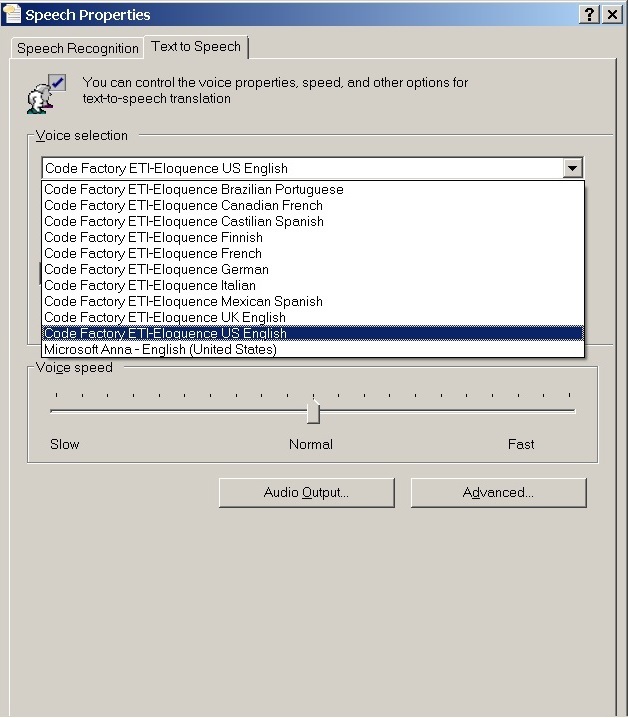 Once the application is installed on your computer running Windows, you can select ETI-Eloquence TTS voice in the application of your choice. All versions of Windows Vista and above are compatible with Eloquence for Windows. What is Eloquence for Windows? What languages and voices are supported in Eloquence for Windows? There are 10 languages supported: US English, UK English, Castilian Spanish, Mexican Spanish, German, Finnish, French, Canadian French, Italian and Brazilian Portuguese. What is a SAPI voice? SAPI stands for Speech Application Programming Interface. 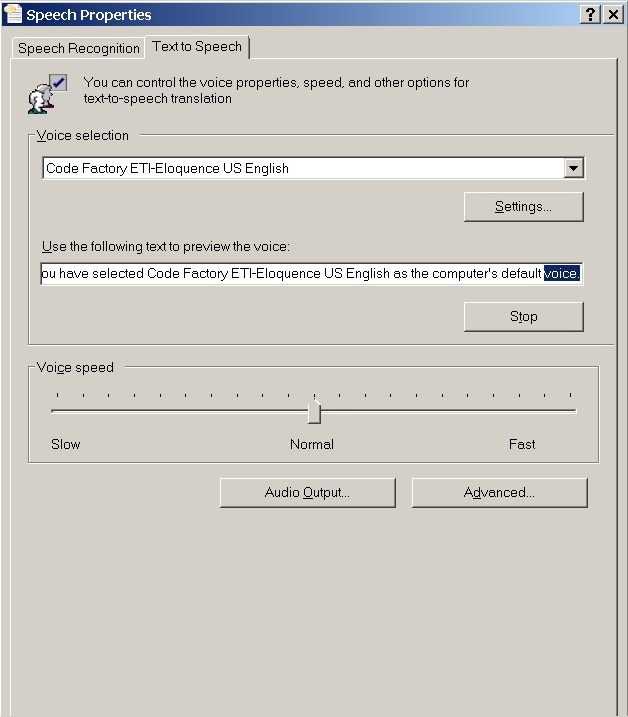 It is an interface developed by Microsoft to allow the use of speech synthesis in Windows applications. Eloquence for Windows supports SAPI v5, which is the latest version of SAPI. What screen readers will it work with? Eloquence for Windows will work with all popular Windows screen readers, including NVDA, Narrator and Window-Eyes. Can I use Eloquence for Windows with other software like Book Readers? Yes, Eloquence for Windows will work with all popular book readers and any other application that uses SAPI v5 voices. A shortcut will be automatically placed on your desktop and Start Menu during the installation process. 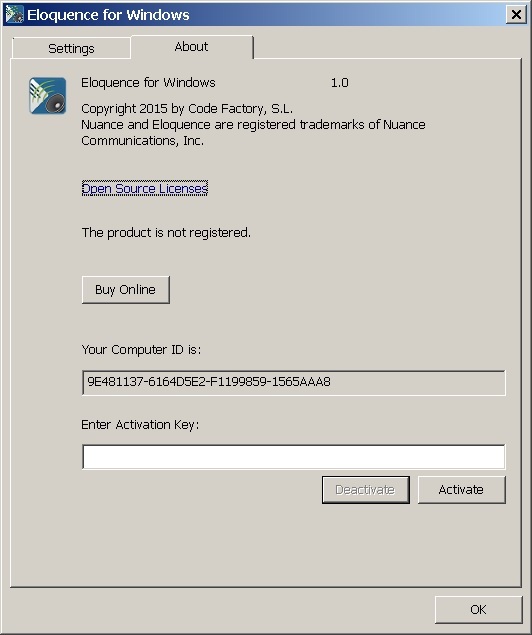 Please download and install Eloquence for Windows and select the “Buy now” option inside the app to purchase your license. You can use either credit card or paypal to purchase, using the 2checkout payment gateway. After payment has been accepted, your activation key will be sent by email to the address that you provided in the purchase process. The recommended retail price is 59 Euros. As the payment gateway converts this to your local currency, the price may vary in your local currency. 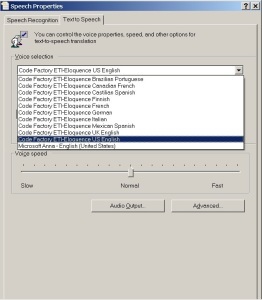 How can I open the Windows Speech control panel to select Eloquence for Windows as my default TTS? Regarding Eloquence for Windows: I’m going to the public library today to spend a few hours working on a public PC. Can I use one of my activations so I can use the app on the library PC? Yes. 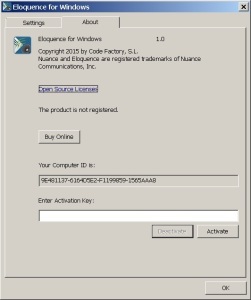 You’ll first have to install Eloquence for Windows on the public PC (for example via the download web page, or by copying the installation file to a pen drive and installing it on the public PC). Once installed, you’ll be able to use one of the three activations associated with your activation key to temporarily activate the license on the public PC. WARNING: it is very important to remember to deactivate the license when you are finished working on the public PC, since otherwise one of your three activations will remain associated with the public PC and you will not be able to use it. On what other platforms do you offer Eloquence? Code Factory also offers “Eloquence Text To Speech” for Android. It is available on Google Play: https://play.google.com/store/apps/details?id=es.codefactory.eloquencetts&hl=en. Please open a ticket at our help desk: https://www.codefactory.cat/helpdesk/.